Several months ago, we wrote an article about a collection of Crane's and Guy's potato chip pins that has been one of our most popular blog articles to date. There is very little information available about these pins, but it seems that many people remember them from their childhood and have come to thoroughly enjoy collecting them as adults. Because there is no information about these pins anywhere else, it has taken some trial and error on our part to figure out what years they were made. The 1965 Crane's pins actually have the year stamped on the back. We mistakenly identified the red, white, and blue pins as the 1965 issue, but we now believe they are from 1969 thanks to a phone call from a customer. We also found what we believe to be a 1968 Crane's pin, which has the silhouette of a crane stamped in orange on the back. We are going to continue researching both Crane's and Guy's pins and we always appreciate any additional information from collectors. 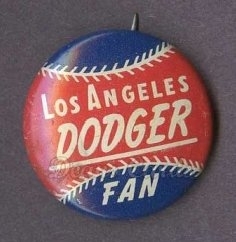 I found a group of 11 of these pins pinned onto a piece of paper detailing the rules of the 1967 CRANE Baseball Contest. I noticed that on e-bay, some pins go for 70.00, while others go for 7.00. Are some considered rare? We lived in Champaign Illinois in the late 60s, so I wonder if my dad was collecting them. My brother would've been only 6, so I don't think it was him. Anyway, thanks for the post. Interesting!